The conference (1-day conference, october 19th) kind of frustrated me, as 2/3rds of speeches were in Turkish, so I had to ditch my plan to attend certain events, and half of the time was roaming around the conference floor. 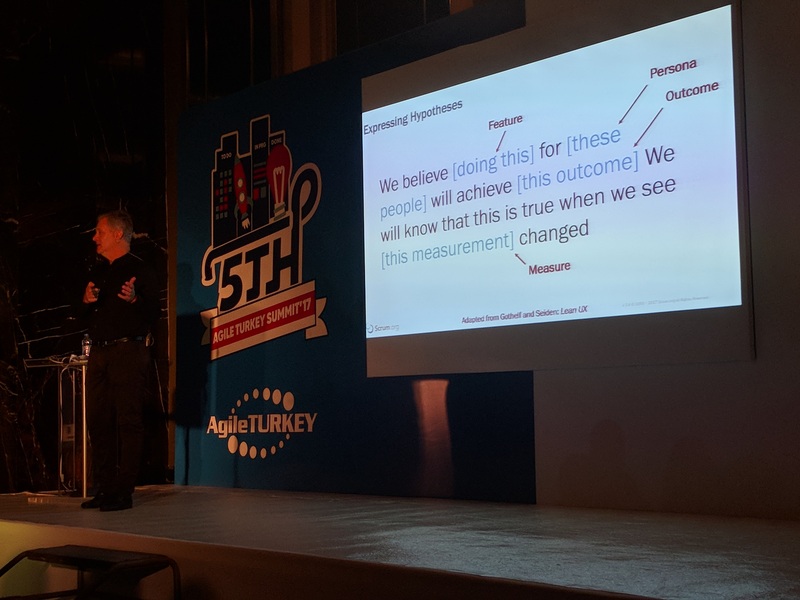 Dear people who stand behind this huge event, Agile Turkey team, please make a note next to the speech, that it may be in Turkish next time 🙂 That would be awesome! The awesome part of that was that English-speaking crowd (mostly invited speakers) were roaming around the vortex (as Kurt Bittner joked) as well. Noone occupied their attention (possibly because of the language barrier), so I’ve turned that into 2-3-hour-long interrogations! The Bag ‘Shift Happens. Be Agile’ has a nice slogan, but poor quality 🙂 Lots of spam from sponsors and small notebook with the pen. Felt like I’m on my local UfaDevConf conference. I’m so glad that I’ve attended to one of Dave Snowden’s speeches! He’s an amazing guy, I love his approach to not treat metholodogies and frameworks as silver bullets, I love how he merges anthropology with IT – and I share this approach wholeheatedly (given my specialization in Applied IT in Psychology). Keynote was called COMPLEXITY, CULTURE AND CONFUSION. Snowden described cynefin model, which I find as an universally applicable framework for sense-making. My experience with cynefin emerged when we were trying to find an already-existing model of describing various projects we had at SkuVault with Ksenia. And guess what: it fits and describes how we firefight, develop new features, research/migrate/stuff bumps as a sequence of cause-effect perfectly (and I’ll write about that soon). Perception over mindset: I’m so agreeing with him, that mindset cannot be changed after it’s declared to be agile: you start with slow process and transparency improvement – and over the time the team becomes more agile. And only then the inner understanding of the business agility is fulfilled. As soon as the company declares it’s now agile – it’s definitely the opposite (which is derived from the first bullet). There’s a thin line between simple and chaotic systems in cynefin, and you may even not see if you’re already in chaos: it may be calm on the outside. Work on company’s perception among the clients. Clients remember all past negative events you had. Interview the clients / market, and make sure you address the question: ‘what can we do so that clients don’t say this the next time’, instead of justificating your actions. Company’s culture is to be inherited. There should be a knowledge sharing, when the creators transmit their values to the others, share both good and bad experiences over the course of the work. Waterfall is not bad (thank god finally more and more people start telling that). And yes, finally, SAFe and NEXUS stop being dynamic, when they scale up! And that’s the disconnection from the original Agility idea! The latter part of me interacting torturing Snowden with questions on remote distributed teams with huge timezone difference, processes and estimations was indeed very satisfying! Lesson learned from almost every speaker I had time to chat with: SkuVault’s case is unique and you empirically find your own path of comfortable pace, workflow and communication. Mr. Snowden also shed some light on asynchronous conference calls they had back at IBM, which seems like a very interesting idea to try now. 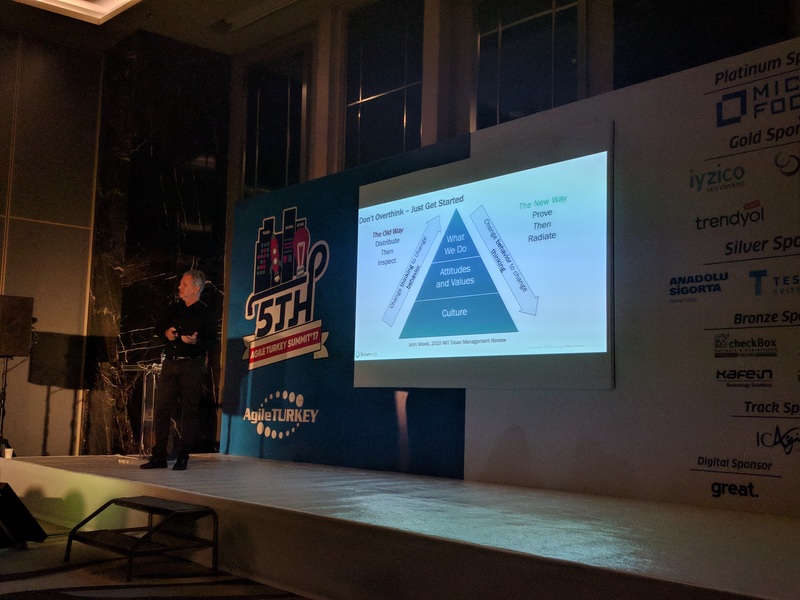 Kurt Bittner was talking about ‘5 THINGS YOU NEED TO DO TO SCALE YOUR AGILE ADOPTION’ (http://www.summit.agileturkey.org/session/5-things-you-need-to-do-to-scale-your-agile-adoption/). How does Scrum work, when the team is distributed, when there’s a language barrier, when timezone difference is 9-10 hours? (>> scrum works, but that depends on how comfortable the team is overall with scrum and everyone’s got own approach, mixed with constraints that every organization has). We recently worked on migrating a huge chunk of SkuVault to a new architecture and it was chaotic, is Scrum a good way to handle such? (>> R&D projects may work with Scrum pretty good, however in our case there’s no clear answer because using micro-sprints for 1 day and have a whole retro for that seems obscurely inefficient and redundant). Politics (eww)… Skiing & Hiking in Colorado and generally in the world.. Does iPad Pro 12″ really allow you to do general work without bringing your laptop (for mail and notes yup). Estimates – what does he think of them, do we even need them fully in scrum? (>> Kurt is not a fan of estimates. If you got a timerange – better give it (doing this myself all the time), and estimate is really needed only in times when you have to understand project phase length). Kurt was not just helpful, he’s been my savior in the middle of turkish-only-speaking crowd 🙂 I thank him greatly for expanded answers, references to his experience and knowledge sharing! Simon Orell told an interesting story on his experience in applying Scrum (although modified) in building gas turbines (!) in Canada (BILLION DOLLAR AGILE: APPLYING SCRUM VALUES AND PRINCIPLES TO LARGE CONSTRUCTION PROJECTS, ) – COOL! Scott Ambler told about pragmatic way of looking at company transformation in his ‘THE DISCIPLINED AGILE ENTERPRISE‘ speech.